You are socially bankrupt. 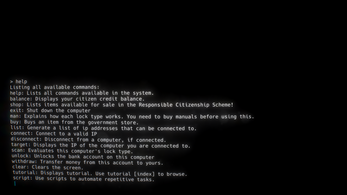 Your citizen credit balance has hit 0, and all you have left is your GMCC 867K Cybernet-enabled Terminal and your skills in hacking. The accounts of those good citizens - never speaking up and never complaining - sit open and ready for the taking. You plan to climb your way back up the social ladder, through any means necessary. 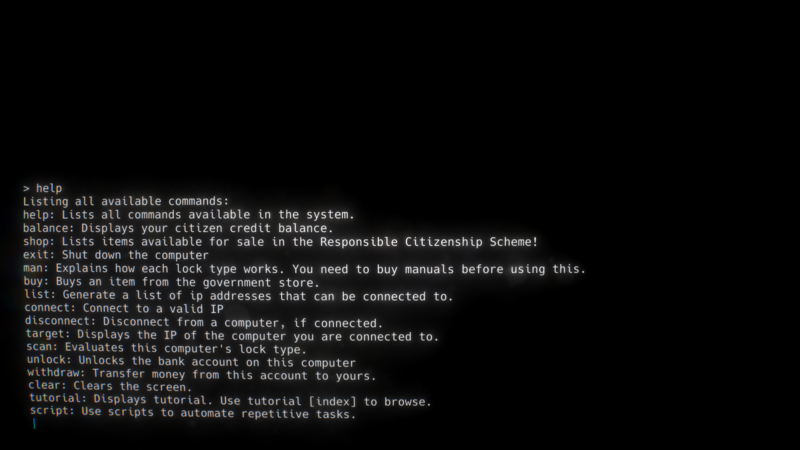 Citizenship++ is an incremental hacking/puzzle game in which you hack the citizen credit accounts of anonymous people in a tightly-controlled surveillence state. 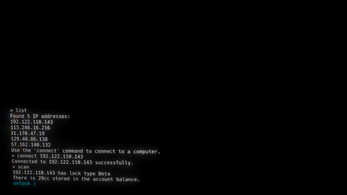 Initially only armed with a blank terminal you will unlock increasingly advanced features, all the way up to a scripting engine that will allow you to automate the hacking of accounts. 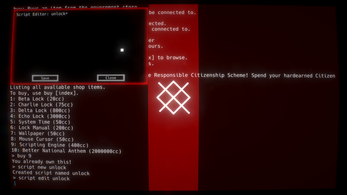 Citizenship++ was developed in 72 hours for the Ludum Dare 41, with the theme "Combine 2 incompatible genres". 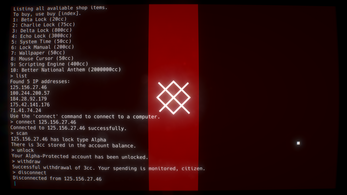 We decided to combine a hacking game (like Hacknet or similar) with an incremental game. Are they really incompatible? Yes. Don't question it citizen. Minus 10 credits. 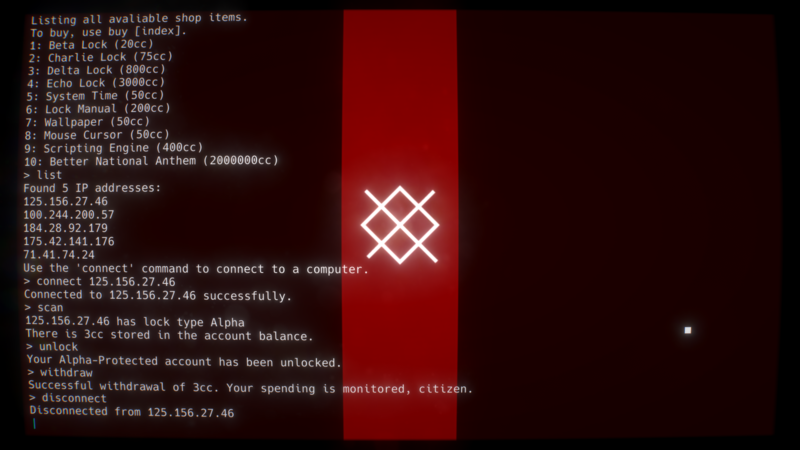 Note: the Linux build of the game is untested. It shouldn't have any issues, but if you find any, please let us know so we can fix them! wow this is a really cool game! i loved being able to create the scripting. very cool idea! Hi, really a great game ! Hi, we don't have much complex syntax in the game if that's what your asking about. You can only type single commands at once, so no pipes, variables etc. The game doesn't save anything, so it shouldn't be possible for you to get locked out like that. How does this issue present itself? Does it always say the "Echo is infintely secure" message? I'm not entierly sure what you mean since echo locks don't lock you out after a set number of attempts. is there a save feature in the game by chance? No, it was something we did consider but didn't really have the time. Our thinking was that people wouldn't play it for very long since it was a game jam, so we decided to put more effort into polish and other features. If there's enough demand I suppose I could add a save feature in an update. This is a really fun game! 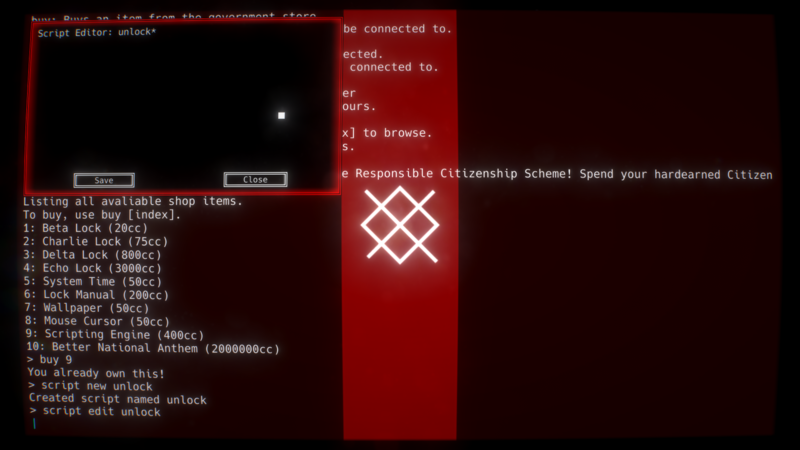 I enjoy programming games like this, and this is probably one of my favorites! quite annoying how the most common lock is always the one above what you have. That was an interesting experience, I really loved the script editor. :) I'm always a huge fan of programming games, and I think it's quite an achievement when you are succeeding in building one of these in the short time of a jam! <3 Started a bit slow, but when one overcomes the Alpha phase, it gets much faster. Been a bit perplexed about the Echo lock though, but eh, it doesn't discount the value of your work. :) Well done! I recommended your game in one of our compilation articles about the Ludum Dare 41 as well as it's featured in the related video. :) Keep up the good work!